This past week, my husband was in London for work. London is one of my all-time favorite places on the planet– I studied abroad there for a transformative five months. I have wanted to go back so badly, so it was hard to see Joe’s great pictures and not be by his side. And I think it made my week of solo parenting feel that much more mundane by comparison. It was the perfect gift of quilty indulgence. He is so very thoughtful and generous. And so, for the first time in forever (to quote the ubiquitous Frozen) I get to participate in Sunday Stash! Delicious. And so, so soft. It might have to become a garment, pronto. Next up is the roll. Joe asked if they had any “fat stacks,” and they pointed him toward this, a roll of varying-length strips, all WOF. It should be enough for a 50 x 70 quilt top, and better yet, it’s all pre-washed. Here’s the selection. Some fussy florals, but some really excellent ones too. I’ll make it work. I accept the challenge to make these look modern. Though I might split them up. The gears are turning. I mean, seriously. I couldn’t stop giggling. I’m one happy quilter today. Linking up with A Stitch In Between and Molli Sparkles for Sunday Stash! 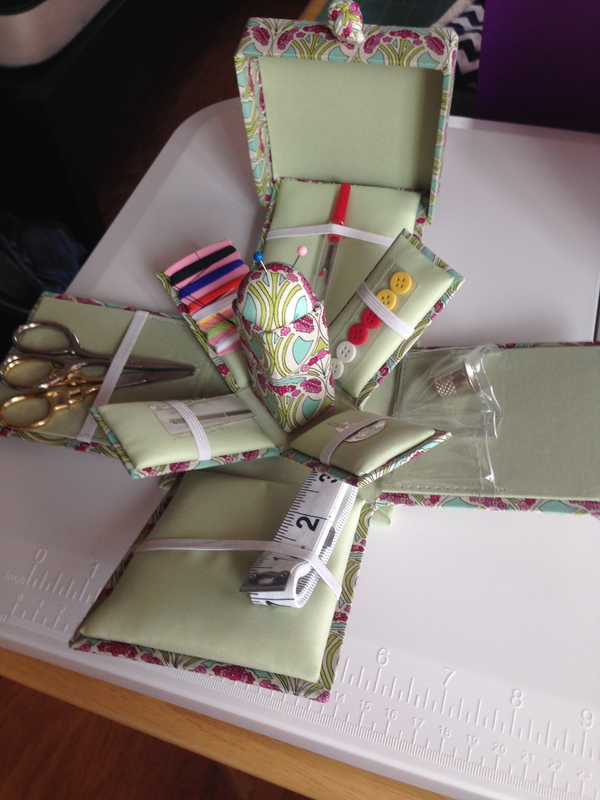 I know a lot of my local quilty friends were at Quilt Fest– did you shop there? how awesome are these gifts?! that first print is SO YOU. he did so well! He is ridiculously amazing. I think I’ll keep him. How perfectly rude in an innocent way is that etui? But gorgeous, like the fabrics. You have a very nice husband, and I think it’s a great plan to keep him! Oh man, your husband did GOOD. Haha, tell him the internet quilters approve! 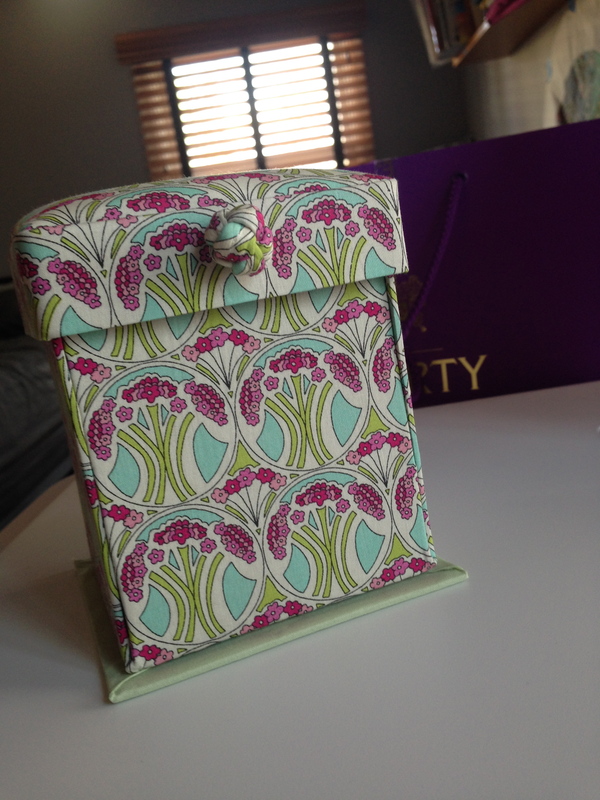 That box is like icing on the cake, it’s super cute, and sewing related! And a surprise! Omg. That box! :O Everything – just awesome! That box is just plain amazing! The first print is my favorite. It’s kinda trippy looking – in a good way. Very nice stashing! Can’t wait to see what you do with all of these beautiful fabrics! Joe out did himself. I especially like the box! Oh Mel! These are fantastic. I have complete faith that you can turn that roll of fabrics into something completely fresh, and modern. What’s old is new again! But that first one is right up my Liberty alley. Sometimes they surprise me!